To meet the requirements for higher bandwidth and throughput, 40 Gigabit Ethernet has become a trend for data transmission. A series of 40G equipment are designed to achieve the seamless interconnection in the 40G network. Devices like 40G fiber optic transceivers and 40G direct attach cables are widely used for the high speed transmission. 40G direct attach cables (DAC) are optimal solutions for short range connectivity. It can be further divided into the direct attach cable and active optical cable (AOC cable). This article will focus on presenting you some cost-effective 40G QSFP+ AOC cable solutions to improve your network. AOC cable is a cabling technology that accepts the same electrical inputs as a traditional copper cable, but uses optical fiber “between the connectors”. It adopts electrical-to-optical conversion on the cable ends to improve speed and distance performance of the cable without sacrificing compatibility with standard electrical interfaces. AOC cable is especially used for short-range multi-lane data communication and interconnect applications. 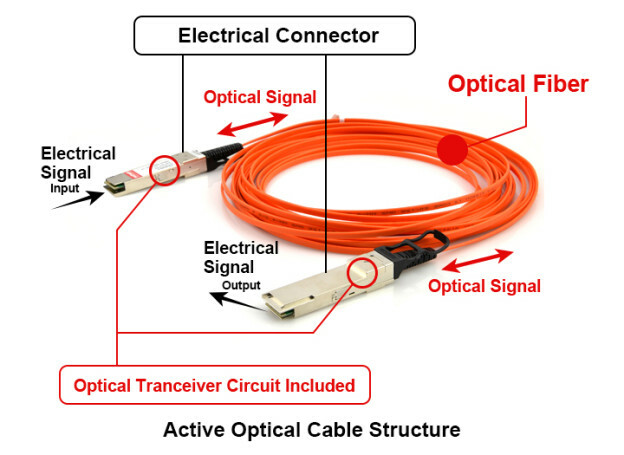 It is made up of the multimode optic fiber, control chip and different connectors with one end terminated with QSFP+ connector and the other end terminated with QSFP+, SFP+, LC or else connectors. However, why do we often use 40G QSFP+ AOC cable instead of QSFP 40G SR4 module? In fact, 40G QSFP+ AOC cable has many benefits that will provoke your interest for choosing it. First is the lower cost compared to the module since the AOC cable saves the need for extra fiber patch cables. Second is the low insertion and return loss. Although it is used for the same transmission distance, the repeatability and interchangeability performances of 40G AOC cable are better than 40GBASE-SR4 module. Thirdly, under the four-quadrant test, which is used to test whether the product still keeps better performance even under the lowest and highest voltage and temperature situations, the AOC cables are qualified to meet all the demands. Here provides some common 40G QSFP+ AOC cable solutions that are welcome in the market. Each end of this AOC cable has a QSFP+ connector used for 40G data propagation. The maximum length can reach up to 100 meters. It is a 40 Gbps parallel active optical cable which transmits error-free parallel 4×10 Gbps data over multimode fiber (MMF) ribbon cables. 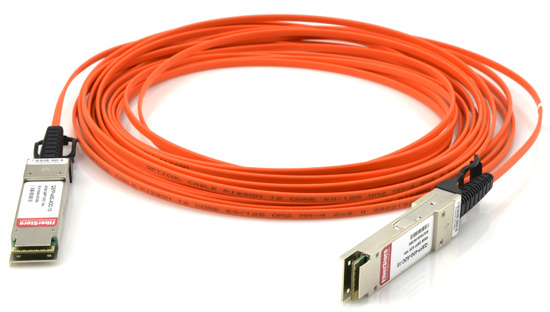 QSFP+ to 4x SFP+ AOC cable is a breakout cable offering the professionals a cost-effective interconnect solution for merging 40G QSFP+ and 10G SFP+ between devices of adapters, switches and servers. Users can install this AOC cable between an available QSFP+ port on their 40Gbps rated switch and feed up to four upstream 10G SFP+ enabled switches. This is also a breakout AOC cable with a QSFP+ connector on one end and 8xLC connectors on the other. It is a high performance, low power consumption, long reach interconnect solution supporting the 40G Ethernet compliant with the QSFP+ MSA and IEEE P802.3ba 40GBASE-SR4. It is an assembly of 4 full-duplex lanes. Each lane is able to transmit up to 10 Gbps data rate providing an aggregated rate of 40 Gbps. Along with the popularity of 40G Ethernet, the market of 40G QSFP+ AOC cable has been growing over the years. It is definitely a better choice for high speed transmission over short distances. Additionally, if you are looking for higher bandwidth AOC cables, there are also 100G QSFP28 AOC cable and 120G CXP AOC cable suitable for your needs.